James Graham, Marquis of Montrose had been appointed Royalist commander in Scotland in Summer 1644. He successfully defeated Archibald Campbell and in Spring 1645 took Aberdeen and raided south. 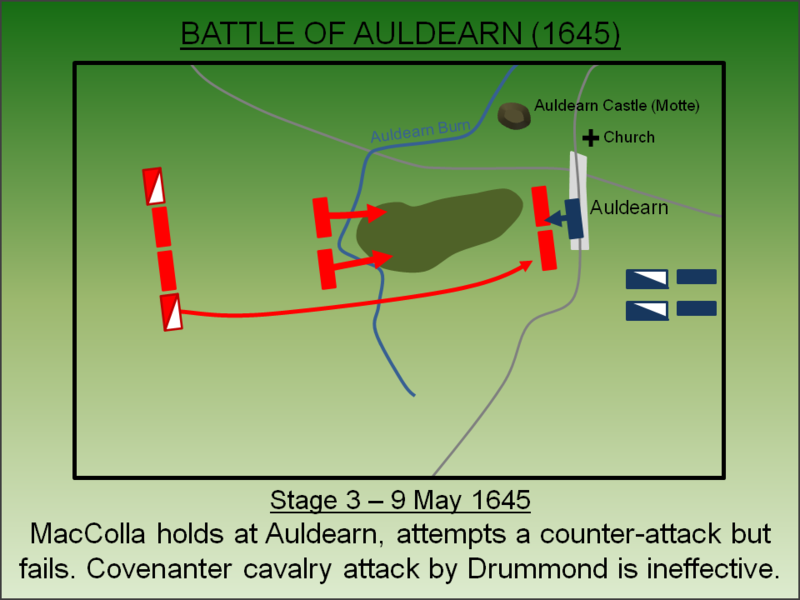 At the Battle of Auldearn a Covenanter Army attempted to stop him but the Marquis soundly defeated them. Since late 1642, England had been embroiled in a civil war between King Charles and Parliament. At this time Scotland was controlled by Covenanters but did not immediately join the war despite previous conflicts against the King. However in August 1643, after a sustained diplomatic mission on behalf by John Pym, the Solemn League and Covenant was signed between Scotland and the Parliamentarians. In exchange for an agreement to introduce Presbyterian doctrine into England, Scotland entered the war on the side of Parliament. Scottish forces invaded England in January 1644 under the command of Alexander Leslie, Earl of Leven and played a key role at the Battle of Marston Moor (1644) which saw the Royalists in northern England decimated. By Summer 1645 the Royalist war effort in England had all but collapsed following their defeat at the Battle of Naseby. However, in Scotland the situation was different. In Summer 1644, King Charles appointed James Graham, Marquis of Montrose as Captain General in Scotland. Although he had fought against the King as a Covenanter commander during the Bishops War, he had opposed the subsequent power of the Presbyterian leadership under Archibald Campbell, Marquis of Argyll. Montrose effectively mobilised the Highland forces, many of whom were opposed to Campbell, and achieved a number of rapid successes. At the Battle of Tippermuir (1 September 1644) he had captured arms for his small force facilitating his assault on Aberdeen later the same month and in February 1645 he defeated Campbell at the Second Battle of Inverlochy with a stunning advance over Ben Nevis. Following the victory at Inverlochy, Montrose marched his force alone the Great Glen to Inverness and then on towards Elgin. Here his small army was augmented by an additional 500 troops from the Gordan and Grant clans enabling him to go on the offensive again. He occupied Aberdeen and from here launched attacks on Brechin and Dundee. He attacked the latter on 4 April 1645 but, alerted to the raid, a Covenanter army under Lieutenant General William Baillie marched north from Perth. The Royalists retreated just in time - allegedly leaving the town via the East Gate as Baillie marched in via the West Gate! Major-General Sir John Hurry (also known as Urry) was sent in pursuit of Montrose with a Covenanter army. His force was small and he was relying on rendezvousing with reinforcements at Inverness before engaging the Royalists. Montrose knew he needed to engage Hurry before he got too strong especially as the Covenanter General was targeting the lands of the Gordans - key supporters of the Marquis. A small action was fought as the Royalists crossed the River Spey but Hurry skilfully withdrew and continued his move towards Inverness. On the evening of the 8 May 1645, the Royalists camped to the east of Auldearn intent on marching on Inverness the following day. However, Hurry was already in vicinity of the Highland capital, had rendezvoused with his reinforcements and moved onto the offensive. Overnight on 8/9 May 1645 he force-marched his men to Auldearn intent on launching a dawn attack on Montrose. The Covenanter troops consisted of seasoned soldiers many of whom had fought at Marston Moor the previous year. They were augmented by local clans led by their own gentry. The Royalists were fewer in numbers but had an advantage in cavalry. A large portion of the infantry were under the command of the Irish General Alasdair MacColla. Hurry's intent to launch a surprise dawn attack on Montrose failed as, overnight on the 8/9 May, the Marquis had become aware of the Covenanter presence. Due to torrential rain, Hurry ordered his musketeers to fire their matchlocks in order to ensure that they were still functional and had not become water logged. This was heard by the Royalist scouts who duly reported back. 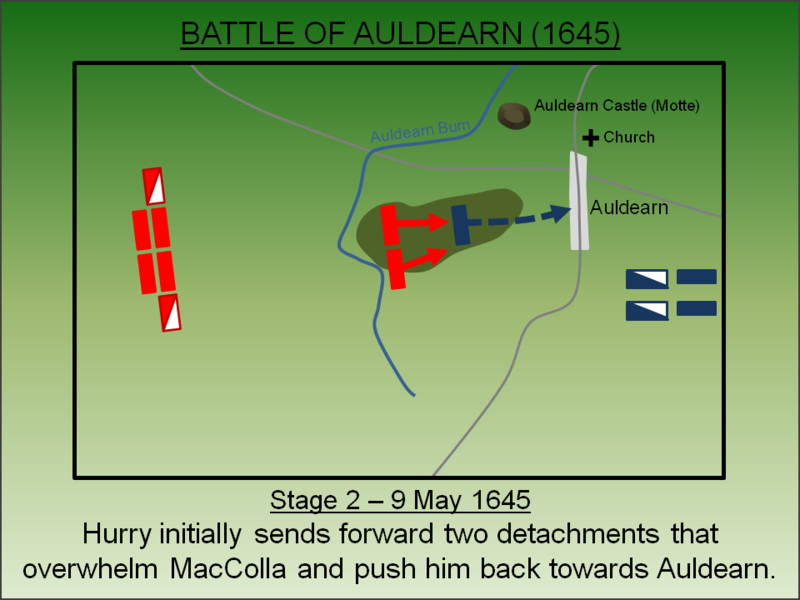 The bulk of the Royalist force was positioned to the east of Auldean but the Irish troops under General Alasdair MacColla had occupied the village. With Hurry advancing from the west, Montrose ordered MacColla to occupy a low rise overlooking Auldearn Burn. The remainder of the Royalist army was out of sight of the advancing Covenanters and MacColla was also given the Royal standard - an attempt to persuade Hurry that MacColla's force represented the whole of Montrose's force. Despite the presence of the Royalist standard, Hurry suspected this small force was not Montrose's entire army and initially just sent forward two detachments - Lawer's Regiment of Foot under Sir Mungo Campbell and Clan Mackenzie under George Mackenzie, Earl of Seaforth. They made a determined advance against MacColla and, with the Irish forces heavily outnumbered, pushed him back towards the outskirts of Auldean village. MacColla's men re-established their line and checked the Covenanter attack. Although he had been ordered by Montrose to stay within the relative safety of the enclosures around Castle Hill, a lack of powder prompted MacColla to launch a counter-attack but this failed due to the marshy ground. Hurry then sent his cavalry, led by Major Drummond, against McColla but this attack went amiss and deteriorated into a shambles as they blundered into their own lines. When they finally engaged with MacColla's men they failed to have a decisive effect with the battle becoming entrenched amongst the streets of Auldearn. Montrose had now finally prepared his main body of men and, to relieve the pressure on MacColla, Montrose sent his own cavalry into action. 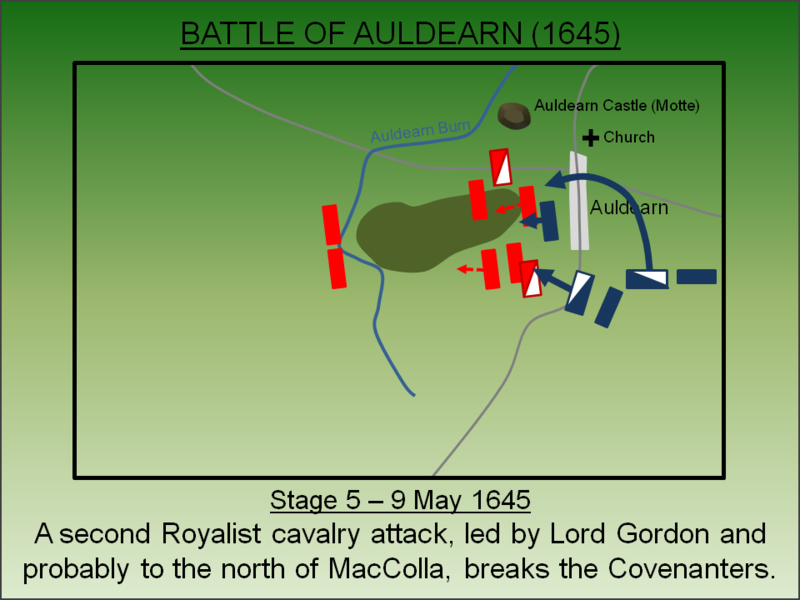 Under Lord Aboyne, the Royalist horse launched an attack to the south of MacColla. They drove off Drummond's Covenanter cavalry which fled into the Lawer and Seaforth lines. Shaken both infantry regiments fell back but did not rout. 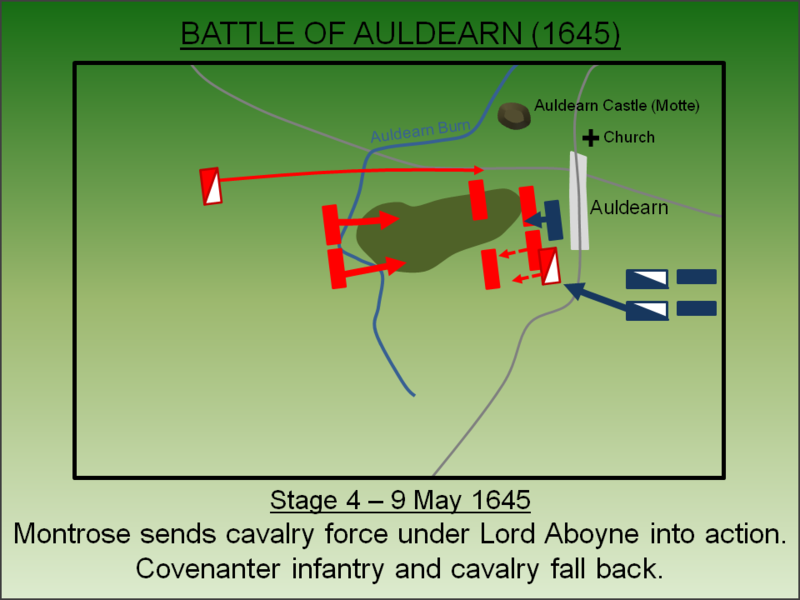 A second Royalist cavalry charge, possibly to the north and this time by Lord Gordan, hit the Covenanter infantry forces whilst they were still entangled with their own cavalry. The Covenanter force broke with the horse fleeing and the infantry routing. The Royalists now smashed into the main Covenanter line - still seemingly not fully deployed. Fierce fighting ensued first with ranged musket shot and then closing into hand to hand combat. 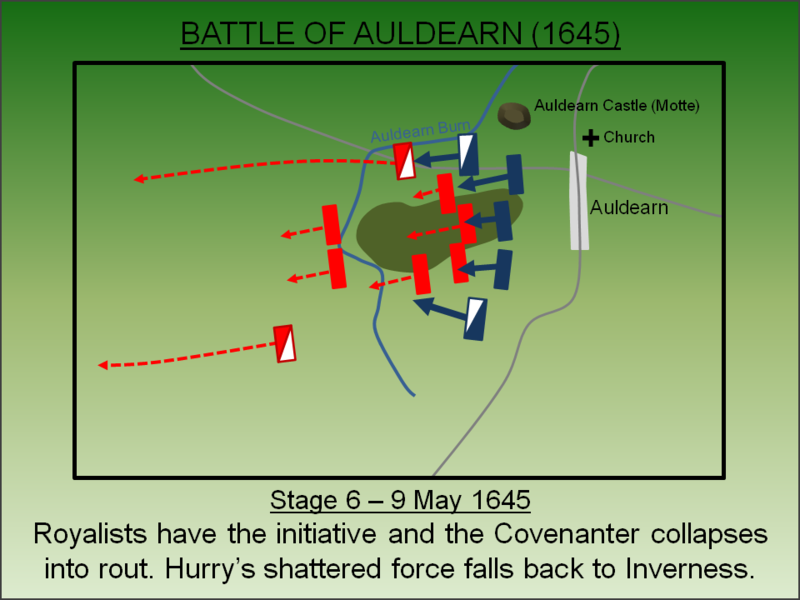 Although outnumbered, the Royalists had the momentum and the entire Covenanter force broke into rout. Montose's flank attack, described at Stages 4 and 5 above, has earned him praise both from his contemporaries and subsequently by various commentators. However some authors dispute whether the attack was indeed a 'flank' attack or just a head-on assault. In this instance, such an argument is pointless - the Royalist attack created a strategic shock which broke the Covenanters. The precise angle of attack, i.e. whether it can be determined a 'flank' attack or not, is moot. Auldearn was yet another victory for Montrose fought and won against the odds. 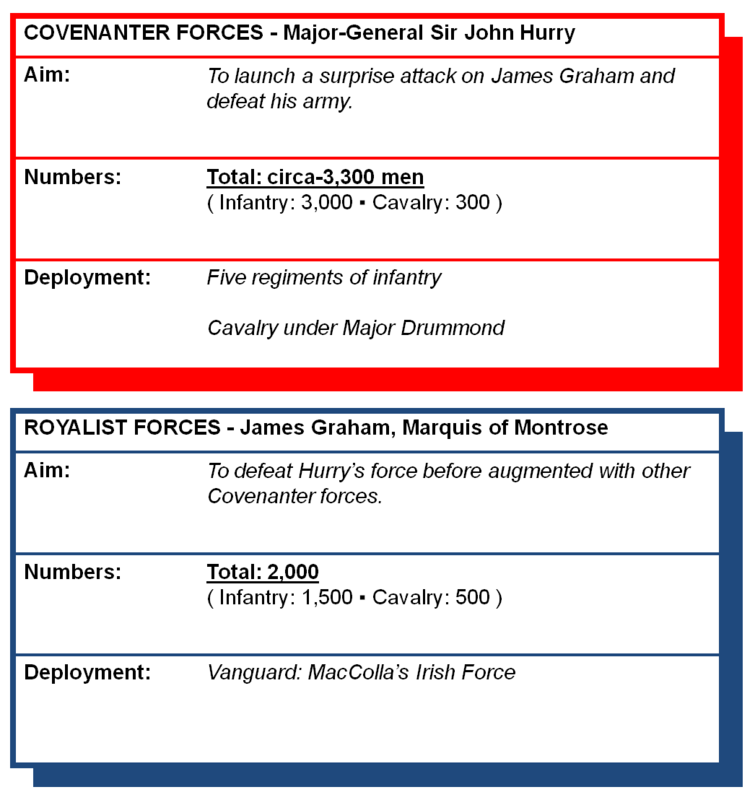 Hurry managed to extract the bulk of his cavalry and retreated to Inverness which, despite the Royalist victory, remained safely in Covenanter hands. There he found a scapegoat in Major Drummond, the individual who had led the disastrous cavalry attack, who was shot out of hand. For the infantry fleeing the Royalists, the death toll was appalling. Estimates suggest as many as 2,000 Covenanter troops died in the final phase of the battle. 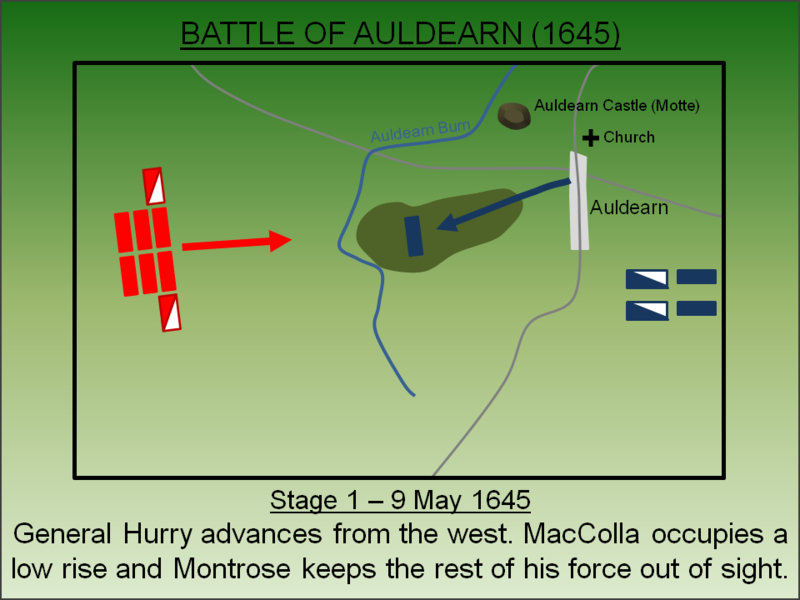 Montrose was to achieve another victory two months later at the Battle of Alford (July 1645), where he defeated General Baillie, but his crowning achievement was the Battle of Kilsyth where he achieved a decisive victory and briefly became master of Scotland summoning a Parliament in Glasgow. However, it was not to last - Major General Sir David Leslie was ordered to return from England and in September 1645 he cornered the Marquis near Selkirk. At the Battle of Philiphaugh, the most successful of Royalist Generals was finally defeated. Lancaster, J.H.D (2014). Auldearn: Battlefield visit notes and observations. CastlesFortsBattles.co.uk. Ordnance Survey, 2015. Auldearn. 1:1250. Southampton. There is no monument to the battle but the remains of the castle offer a superb view of the terrain. An interpretation board has been installed near the Boath Doocot on top of the motte. The castle is at the western end of Auldearn. The road leading to a car park and access to the motte is sign-posted ‘Booth Doocot and Battlefield Viewpoint’.